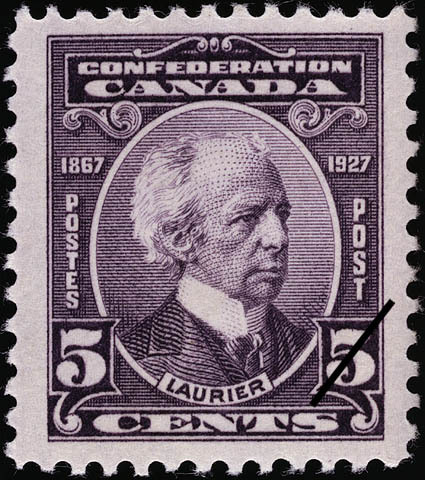 The value of a Laurier - 5 cents 1927 stamp depends on several factors such as quality and wear, supply and demand, rarity, finish and more. Values in the section are based on the market, trends, auctions and recognized books, publications and catalogs. This section also includes information on errors and varieties and characteristics. Portrait of Sir Wilfrid Laurier, born in 1841, in the village of St. Lin, Quebec. He entered the federal Parliament in 1874, and in 1877 became a member of the Dominion cabinet and prime minister in 1896. In 1897 Queen Victoria knighted him while he was attending the ceremonies in connection with the Diamond Jubilee of her accession to the throne. He died during the winter of 1919, and was buried in Notre Dame Cemetery, Ottawa.